Topographical engineers were established as an independant branch in 1831. 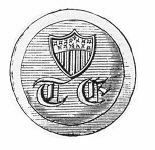 The button with the letters "T.E." and shield was adopted in 1832. 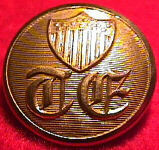 The branch was the smallest in the United States Army and their buttons are uncommon. On the eve of the Civil War there were 44 officers assigned to the topographical engineers. They had an impressive record of mapping the western United States. The topographical engineers were merged with the corps of engineers on March 3, 1863 by act of Congress. These men were artists as well as soldiers and the many fine maps in the Altas to Accompany the Official Records of the War of the Rebellion are examples of the excellent work of these men.